← Valentine’s with Bite Giveaway! Felicity: Good morning, Loren. I’m finally getting to talk with you after having to delay our little chat by a week. I can’t wait to get you answering some questions. Loren: I’m very happy to be here. Sometimes, it is nice to get away from the elf kingdom. Felicity: Council being pains in your arse again? Felicity: Let’s start things off with topics close to your heart… namely Olivia, because a lot of your fans had questions to ask about her specifically. Felicity: So regal. Diana Manolova Dimitrova asked whether you think that the Elven people will accept Olivia as their queen and will respect her, even though she comes from the human race? Loren: They are growing to like her, and she is accepted in many of the villages now, and of course in the castle. Some still hold on to the view that I should have chosen a female from within elf society, but the majority are believers in fated mates, and think I have done the right thing in choosing Olivia as my princess. Not queen, since I am not a king. Felicity: Because you share the role of leader of your people with your brother, Vail, but Vail is no longer accepted in the kingdom. It must be tough on you. Celita Collins wanted to know whether you get to see Vail more often, now that he has stabilised a little with Rosalind’s help? Loren: I see him when I can. I visited him recently, thanks to Bleu helping me out with the council and covering for me. He is doing well, and I am glad that he has taken to helping others too. I believe it will help him in return, giving him faith that he can purge the darkness. Felicity: You mean Fuery? I think he needs all the help he can get, so I’m glad too that Vail is hellbent on helping him. Kirsty Hatto asked how Vail is coping with his new life with Rosalind? Loren: He has his bad days, but Rosalind sends me regular reports, pictures she has taken, tells me of things they have done together and how Vail’s rehabilitation is progressing. She’s trying various very scientific methods of assisting him… some of which are fascinating, if not a little alarming. Felicity: Vail is strong, he can handle the treatment Rosalind has decided upon, I’m sure of it. When you sneak away to the mortal world to see Vail, do you go elsewhere? Kirsty also wanted to know if you visited Kyter’s club much, and Natalie Muir asked if you visit the mortal realm often and whether you’ve gained a taste for anything from our world? Loren: I have been to Underworld a few times since we last spoke, mostly accompanied by Bleu when he visits with his sister. It’s good to see how she is doing, and to speak with the group who live there. Kyter is quite the male. He’s been enlisting local fae and immortals to assist us in keeping an eye on the movements of Archangel. Felicity: Kyter has spies? How deliciously James Bond of him. What about things you’ve developed a fondness for in our world? Loren: Chocolate. My aides and the council do their best to stop me from having it, complaining about risks to my health, but Olivia pretends it is for her so she can sneak me pieces. Only a little. She does the same with coffee. My council also try to convince me it is evil and something I should be avoiding. Loren: I don’t know what you are talking about. Felicity: Yeah, you do. I’m going to swing my questions back to your missus now, before you start blushing, because Natalie also wanted to know if there’s anything Olivia has taken to in your world? Loren: I think she is introducing me to things more than I am her. She’s taken to growing vegetables never before seen in the elf kingdom, some of which are most unusual, and has developed a taste for what my council have termed “attempted poisoning”. I do not recall the exact details, but it involved something called a chili pepper and she put it in a soup, which members of the council then ate… and well… apparently it was a little too hot for their taste. Felicity: Did she do it on purpose? Loren: Oh no, the soup was not meant for them. She made it for herself and Sable, but the council insisted on trying some before I was allowed any… not that I had intended to have any since Olivia had warned me it was spicy and hot… to their detriment. Felicity: You don’t seem too cut up by them getting burned. I wouldn’t be either. Diana Manolova Dimitrova also wanted to know if you think it’s time elf society moved with the times and gave more rights to females, including allowing them into the army? Loren: I am petitioning for it, but many of the higher ranking members of society are difficult to convince, and adamant about keeping things how they are now. Progress is being made, but I think we are a way from seeing females serving in the army. 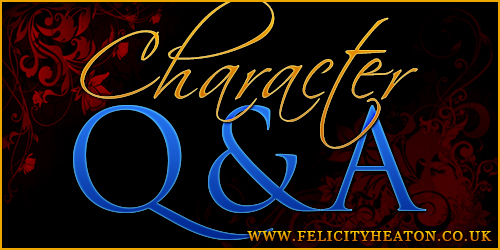 Felicity: Martha Davis Williams had a fab question, because she wants to know if you ever manage to slip away without Bleu tracking you down? She says that she loves how you annoy him that way. Loren: Regularly. Most recently, I left him fielding questions from a group of high-ranking elves about movements of shipments between the elf and demon lands and protection of the goods wagons… because Olivia mentioned wanting to see a fae town. Felicity: And how long was it before he found you? Loren: *smiles* I evaded him for almost five hours. When he found me… it was not pleasant. Felicity: *laughs* I can imagine. I doubt he spoke to you for a week straight after that. Loren: He was rather unbearable. Needless to say, I was not allowed out of his sight for several days. He even spoke of positioning a cot in my room so he could ensure I did not “escape” during the night. I think he was more angry about being left to handle to meeting than my unsanctioned trip though. Felicity: I’d be mad at you too if you left me dealing with the hoity-toity elite of elven society. I’m dragging things back to Olivia again… mostly because I like the way your eyes light up when you think about her. Both Ashley Couch and Lynnette Copp want to know whether you and Olivia are planning to have a child soon? Loren: I would like that, but Olivia is still coming to terms with this new world and her new role in it. Once she is settled, and accepted by all in the kingdom, we can talk about our future. Part of me hopes that when we bring a child into the kingdom, it will have an uncle present in it. Loren: *smiles* Perhaps. I would still like my child to know its uncle though, rather than the stories it might hear. Felicity: True. It wouldn’t do for the council to make your kid believe Vail was evil. You never thought about just eliminating the council? Loren: Yes… daily… but advisors are necessary, and I cannot make such a dramatic change when I have already introduced Olivia into the kingdom. Things must be paced accordingly to allow my people to accept them. Felicity: So, that’s a… they’re living on borrowed time sort of vibe. I’m going to let Bleu keep convincing you that you need them gone. Loren: He does a very good job of that without your influence. Felicity: You mentioned Kyter has spies now, and you’ve been meeting with them. Ashley Couch and Carole Joyce Buckley really want to know the same thing I do… are you devising a plan to deal with Archangel before whatever faction that is working inside them can take action against Hell and the species occupying it? Loren: Yes, and myself, Thorne and Kyter are not the only members involved in discussing everything that has been uncovered. Many of the demon kings are assisting us, and other factions from Hell too. We are determined to stop whatever plan Archangel has. Felicity: I have just one more question to ask. Tracy Benjamin wants you to describe being an immortal. Does it really mean living forever? Loren: No, but the lifespan of an elf can be millennia. My father was seven thousand before he and my mother brought me into this world, and my grandfather lived to over ten thousand before he was slain on the battlefield in a great war with the dragons. We are eternal in our lifespan, but not immortal as humans would think it. We can be killed. Felicity: Living so long must make population control a thing. I mean, if everyone who paired up kept having children, you’d have a kingdom full to the brim before you know it. Loren: Elf society has grown so we rarely procreate before we are two thousand, and with the wars that regularly test our borders, and the darkness that constantly tests us, we lose elves every day. We have found a balance that works for us. Most families have no more than two children. Felicity: I think that’s all the questions we have, and wow, I kept you talking for a long time. I’m expecting Bleu to burst through the door at any second, looking frantic and worried. I take it you did clear this visit with him? Loren: *grins sheepishly but then sobers* I did. He’s visiting Iolanthe with Olivia, probably complaining about wanting to get back to Taryn. Felicity: I’ll let you go then. Give the gang my love, and take care, and thanks for coming for this interview! Thanks for reading my Talking Tuesday interview with Loren and I hope that you’ll swing by the blog again next week to see who we’re interviewing then! This entry was posted in character interviews, Eternal Mates, Kissed by a Dark Prince, paranormal romance. Bookmark the permalink.